Microtubules may be the brains of the cell, particularly neurons—operating like a computerized Lego set. They are large complex scaffolding molecules that work closely with the two other rapidly changing structural molecules, actin and intermediate filaments, to provide structure for the entire cell including the spatial placement of organelles. In neurons, microtubules respond instantly to mental events and constantly build and take down elaborate structures for the rapidly changing axons and dendrites of the synapses. Some think that microtubules are quantum computers and the seat of consciousness. Their lifestyle is quite remarkable. A previous post described elaborate functions along the neuron’s axon including special tagging of cargoes that are transported by distinct motors with complex ancillary molecules for each type of transport. 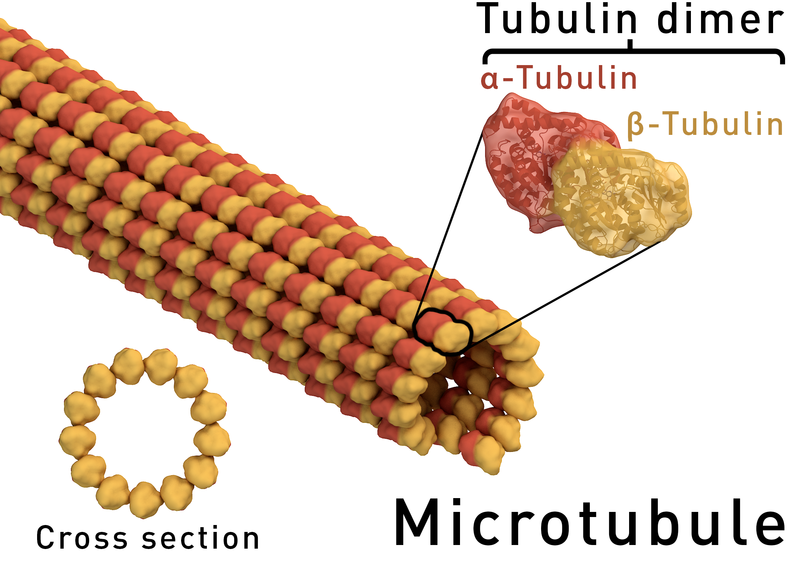 Microtubules are the basic structural elements for cell division. The centromere is a key structure holding chromosomes together. It connects with the kinetochore where microtubule based spindle fibers attach to the chromosomes. Centrioles produce microtubules that orchestrate the rearrangement and sorting of the DNA during the extremely elaborate process of cell division. Complex arrangements of microtubules direct and pull all the elements of the division process through multiple phases. The structure for this process is considered the most complex machine ever discovered in nature and is based on microtubule actions. Microtubules are critical for the neuron’s migration; for the polar structure of the dendrite, soma and axon; and for stem cell’s determination of the type of cell a neuron will become. They are highways for long distance transport of materials and organelles. They are dynamic and changeable with elaborate mechanical functions. They control the signaling at local regions of the extremely long axon. The control of the microtubule function is extremely complex, establishing and maintaining the architecture of the neuron. The control is distributed throughout the cell, which brings up the question of where the central control is to respond to mental events in such detailed and complex ways. They are highly regulated in terms of the number, length, allocation, exact positioning and placement. Abnormalities in any of these functions leads to brain disease. Mutations in the proteins that hold the microtubules in place, such as tau are critical for the development of major neurodegenerative diseases (see post). The motors that move material along the microtubule highways—dyneins and kinesins—and regulators of these motors—dynactins—can produce other brain diseases. Defective transport in the axon is associated with ALS, Alzheimer’s, and multiple sclerosis. Neurons experience major shape changes as they move into place and when they build axons, axon-boutons (endings), dendrites with spines, and elaborate synapses. 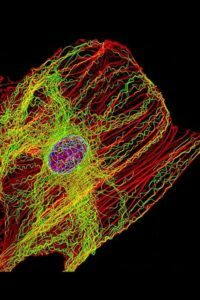 All of these are dependent on microtubules working with the constantly changing actin cytoskeleton. They set up signals for the placement of compartments and organelles in the cell. They are involved in signaling and the critical elements of the primary cilium, noted in a previous post to be the antennae and center of all of the cell’s activity. The microtubule structures are so complex that many of the mechanisms are not yet known. Recent research tools with extreme resolution have shown that these mechanisms are much more complex than previously thought. Signaling pathways have been found that regulate the building, maintaining and rebuilding of microtubule structures. There are many versions of 7 kinds of tubulin molecules named α, β, γ, δ, ε and ζ. The basic linear proto filament is a structure built from two kinds of the protein molecule tubulin—α-tubulin and β-tubulin—put together head to tail and then organized into a hollow tube approximately 25 nm in size. To start structures, a third type of γ-tubulin is necessary. γ-tubulin combines with other large proteins to form a ring complex that is the starting place for the structures. This origination is called nucleation. The structures are built and then taken apart constantly, while the microtubule grows into new regions and then pulls back when the situation changes or the environment is not correct for the structure that is being built. The building and un building is based on the energy source of GTP which binds with free tubulin. One view is that GTP forms a cap at the growing end to hold the structure together. If the GTP breaks apart the structure breaks apart. The two different ends of the growing hollow tube are different. The plus end grows rapidly and just as rapidly can break apart. There are special proteins that grow with the tube and regulate some of the process—tracking proteins or +TIPS. Other proteins are called end-binding proteins EB that connect with many other structures such as motors and actin structures. In fact, it is much more complex. The assembly has many other necessary complex factors including microtubule associated proteins MAPs, other tubulin isotypes, motor proteins and motor attachment proteins, and PTMs or post translational modifications. There appear to be at least five different types of associated proteins. One binds and regulates the dynamics such as + and – TIPS. A second type creates cross-links and stabilization of structures. Another type regulates the sites of nucleation and where the structures are started. This group also breaks apart structures. Another group are motors, such as kinesin and dynein that create movement and mechanical forces related to building structures. The fifth are special proteins that influence the folding of the tubulin molecules and modify the structures. This last group creates many different types of unique structures. 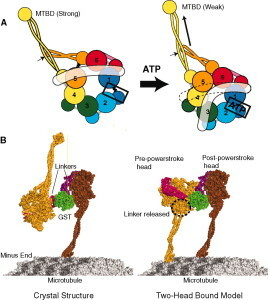 One of the major functions of microtubules is to regulate all transport along the very long axon as well as the cell body and dendrites with unique spines. Specific material has to be sent to each area. 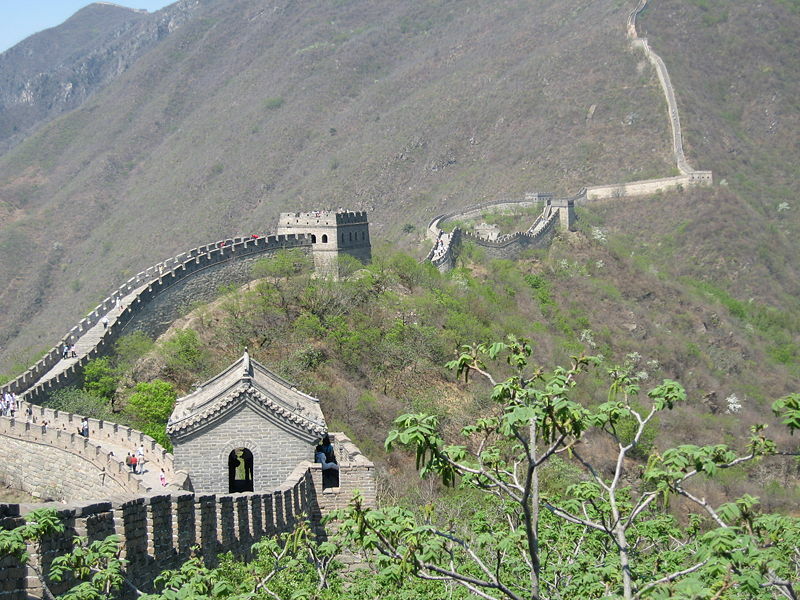 Cells are very small compared to humans—the size of a person compared with Mount Everest. However, when looking at the scale of neurons, they can have axons that are multiple feet long (from spinal cord to hands or legs). Transport at this scale is that of a human walking along the wall of China. The neuron must send a wide variety of specific tagged material to particular places in the cell and along the axon. There is a great amount of signaling regulating this transport. The motors carry organelles, molecules to make vesicles, protein receptors, molecules that are involved in migration of the axon and microRNAs. See the post on Complexity in Transport Along the Axon, for detailed description of how material is tagged, loaded, anchored and delivered. 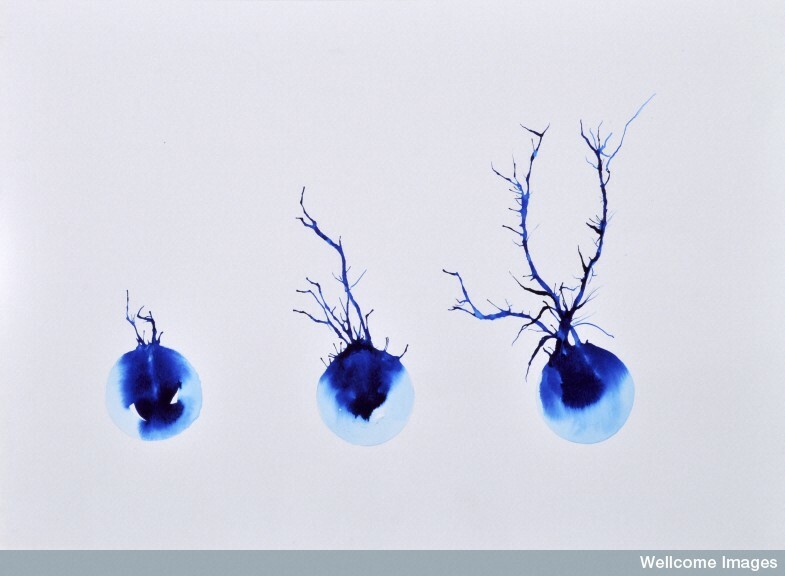 Different kinds of tubules exist for axons and dendrites (+ to the axon and – to the dendrites.) Special motors exist for each. When a neuron is being produced and while it migrates, it changes shape. Other shape changes occur frequently with new synapses both axons and dendrite spines (see post on Dendrite Spine Complexity). When a neuron migrates it produces a process in front, moves the nucleus to the front and then disassembles the process left in back. Microtubules and actin scaffolding direct all of this. The anchor in this process is the centrosome made of centrioles that are made of specific microtubules structures. It produces microtubule connections in the processes moving forward. The centrosome is the organizing center of the actions of microtubules. It is an organelle near the nucleus. Two centrioles at right angles are surrounded by a large protein mass. This very complex machine and directs cell division by pulling all elements of the division through many phases. 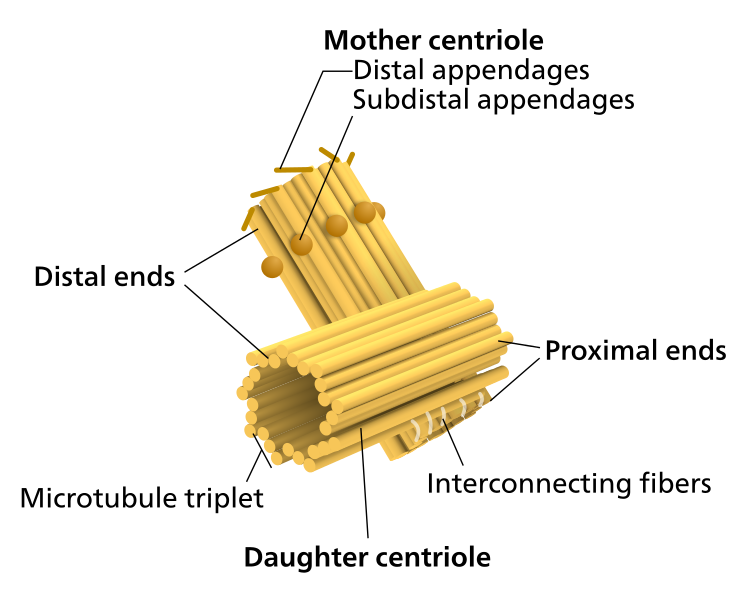 The centriole is a set of microtubules often arranged as a tubule with nine microtubules defining the circle. In some there are other microtubules in the center. (See post on the Primary Cilium for a discussion its centrioles). When centrioles connect, they do so at right angles and these pairs travel to opposite ends of the nucleus in the cell division process. Centrioles are involved in the organization of the mitotic spindle and in the completion of cytokinesis, or movement of the DNA in cell division. 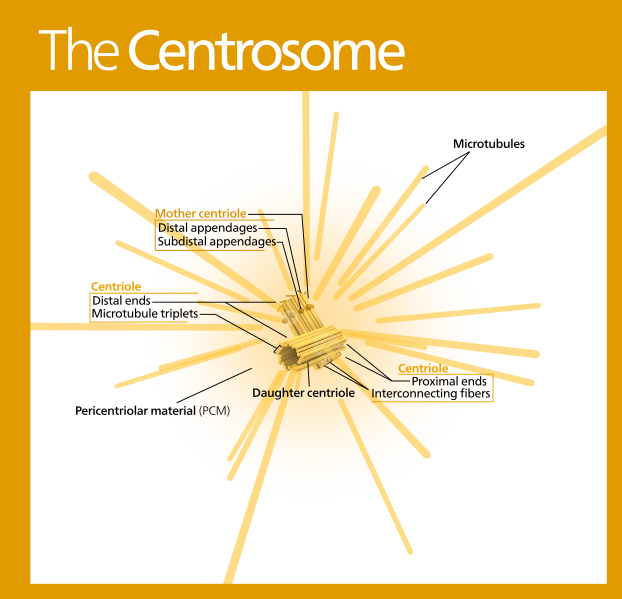 But, centrosomes, made of centrioles, are, also, the critical way the neuron organizes the spreading and constantly changing microtubule structure. In fact, the centriole determines where the nucleus sits in the cell as well as organizing spatial structure of organelles in the cell (golgi, endoplasmic reticulum, etc). 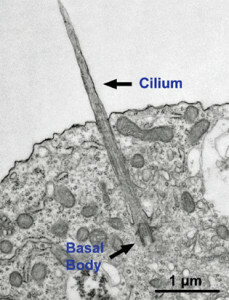 In cells with cilia and flagella, the central centriole determines where it will be. This mother centriole is, also, called the basal body as the starting point of the cell’s entire microtubule process. Microtubules make a large structure that surrounds the entire nucleus in a cage. This cage extends from the centrosome around the nucleus and into the leading process. These microtubules orchestrate the neuron’s ability to migrate. The tubule structure then pulls the centrosome with the nucleus into the leading edge. When the axon starts and grows the cell’s shape becomes polar and asymmetric. 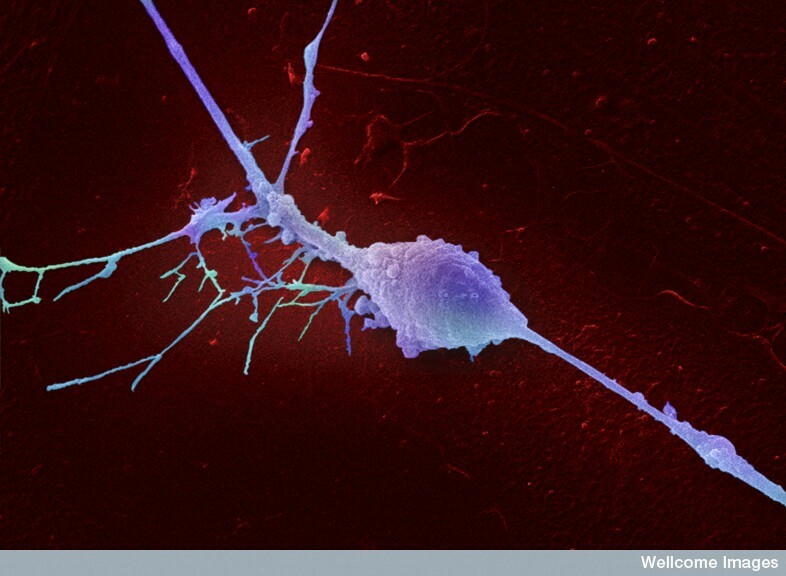 The neurite (start of the axon) grows with bundles of microtubules and a very active actin growth cone. This complex process involves mechanical actions of both. When the neuron becomes a specific type, microtubules take on very specific shapes and have to maintain these with unique stabilizing molecules. This involves very active transport of these stabilizing molecules by kinesin motors. How this is directed is not clear. It is possible that the centrosome and Golgi are involved. As the axon grows longer, many different stabilizing proteins are involved, such as +TIPs, interacting with actin, adhesion molecules, and the microtubules. At times an entire bundle of many microtubules are moved by mechanical forces from motors to allow for changes in shape. When injury to the axon occurs, microtubules are again critically involved in the rebuilding. The microtubules have many different roles in forming and stabilizing synapses. A previous post showed the dynamic changes of dendrite spines and the different shapes. This occurs through microtubule actions. The growth into the spines is regulated by factors like BDNF. 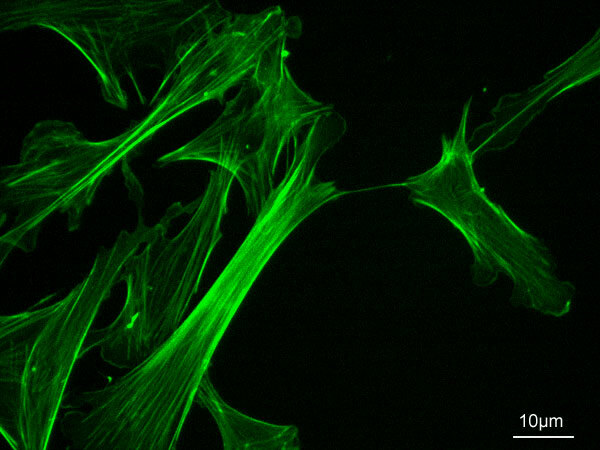 These microtubules bring material for the changing spine shapes with special motors. Axons can have as many as 100 bundles of microtubules in one axon cross section. There are many variations in these lattices with different types of stabilizing molecules, different orientations, and many different associated molecules and co factors. It is so complex that much of the structure is not understood despite extensive research with electron microscopes and thin sections. The initiation and organization of the microtubule structure is often directed by the large MTOC (microtubule organizing center) with the centrosome as one example. They can generate from the Golgi and even in distant regions along other existing tubule structures. 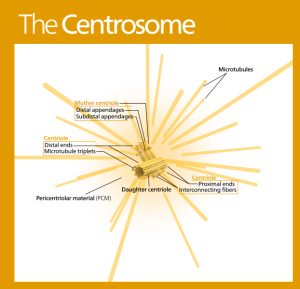 The minus ends are therefore not always at the centrosome. The very first structures start in the centrosome but then as it gets more complex and larger throughout the axon this direction appears to fade and others take it up. A previous post described the critical cellular cilium with their many functions in signaling and movement. These cilia are highly organized by microtubules of particular shape (9 plus 2) and they originate from the centrosome. But most of the microtubules are not anchored at all at either end. Orientations are different, also, when starting from different sources. In dendrites the orientation of plus and minus is half and half, whereas in the axon it is mostly + as the lead. Motors such as dynein can use this by going retrograde. 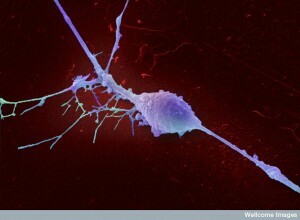 Microtubules are constantly enlarging and shrinking in both axons and dendrites even in a mature axon synapse. It appears that some are stable in these mature situations and others are not. Areas that are more stable have many more associated proteins and linkages. There are a variety of different tubulin molecules that build the microtubule and the basic structural α-tubulin and β-tubulin have variants making it more complex. These variants are called isoforms and are produced by different genes, different alterations that occur in the protein once it is manufactured and different filament structure. One difference is the sequence of amino acids in a section of the molecule that sticks out from the structure as a tail in different shapes that form a pattern and a code. These differences in sequence appear to have functions in different types of cells. Mutations in these tails are related to brain diseases. One type has been associated with ALS. There are, also, special chaperone molecules that help the tubulin protein molecule in folding. One particular mutation in the chaperone causes a devastating human disease with severe developmental symptoms. The modifications of the tubulin tails can occur after it is part of the lattice. Some of these modifications can help with the stability of the structure over time. They can attract special molecules that stabilize the structure and stop decomposing of the tubule. There are many modifications of these tails including removing an amino acid, cutting of a section and tagging with acetyl, phosphorylation, glycylation and polyglutamines. There are specific enzymes that work with these tags for particular purposes. Modifications are noted in certain sections of the neurons that obviously have a particular function. This appears to be another elaborate code that is not yet understood. Enzymes with other functions appear to operate on microtubule tails. For example the enzymes that taking off acetyl marks on histones—histone deacetylase or HDAC—also operate on these tails. The initial segment of the neuron organizes the flow of material into the axon, not allowing diffusion of many proteins that remain in the cell body. It allows certain types of transport into the axon and not others. An unusual bundle of several microtubules are found in this region, which may be related to initiating the action potential. These have many cross-links into a structure called a fascicle. These also appear to be related to regulating the flow of the tau molecule between the axon and the cell body. Many different factors, motors, and protein complexes regulate the complex 3D dynamic lattice of microtubules. γ-tubulin forms an elaborate complex to start the process that becomes a template to build the structure at the beginning. It can start in the centrosome or not. It was thought that these non-centrosome structures were cut from the original complex, but there is no real evidence for this. Some organisms have active lattices without any centrosome at all. The original centrosome is taken apart after differentiation of the neuron (choosing a complex shape). Recently some γ-tubulin has been found in axons and dendrites. Origination sites have potentially been found at the Golgi, at the plasma membrane and other places. Golgi establishes its own elaborate microtubule lattice sending material towards the front of the moving neuron. Golgi appears to have the mechanism to start structures related to other purposes. Golgi has its main operations in the body of the cell but has other outposts in some dendrites that help create the dendrite shapes. But, there appears to be other γ-tubulin present and other sources to start the scaffolding. New lattices can branch off of existing ones as well. Special proteins have been found that binds to the microtubules and then attracts γ-tubulin to start another scaffold. Special enzymes cut part of a microtubule lattice and use it to create a new lattice. There are three families of enzymes that provide this service—katanin, spastin, and fidgetin—that are part of a large group of enzymes that take apart protein structures. These enzymes appear to be particularly important in making branches in the axon to form multiple boutons and in dendrites making multiple spines. The cuts are not random and are regulated by the special proteins associated with the microtubule structure. They are, also, active during synapse pruning. One hypothesis is that these cutting enzymes are connected with the defects in the stabilizing protein tau that is involved in Alzheimer’s disease. 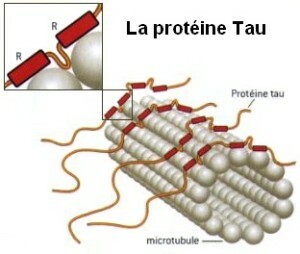 The protein spastin appears to be related to the abnormal placement of tau. This theory is that misplaced tau triggers an enzyme related to tagging with polyglutamine and this then causes the spastin to start breaking apart microtubules. Some findings related to kinesin motors are consistent with this as well. If a microtubule is cut, both pieces can start new lattices. Special proteins appear to notice the cut and find and cap the negative ends that stabilizer these new beginning structures. These caps stop further breakdown of the lattice. These proteins have been correlated with creating specific types of axons and dendrites and the production of asymmetrical neurons. There are many different kinds of microtubule lattice structures that are quite different in terms of stability. Some have many proteins attached to hold the form, while others may use tubulin that has specific tags. One particular tag—polyamination—is critical for stability. Particular polyamines create special characteristics of the structure—putrescine, spermidine and spermine are examples. These very stable sections can be moved to other regions to create special very stable structures and compartments. There are other equally important mechanisms with other proteins, some connected to the Golgi. From the centrosome, the plus ends grow out in a particular direction that leads into the axon initial segment and then the axon. It is not known how it understands to orient in straight parallel bundles. Those that are cut and stabilized are bundled with existing tubules. A particular kinesin motor has cross-link behavior and tau holds some bundles together. Those tubules that are not oriented properly are removed. Dynein motors help to emphasize the plus end version and push back the minus types. There are many different motors involved in complex ways. Kinesin-5 and 6 are motors that slide and coordinate the orientation of the tubules. 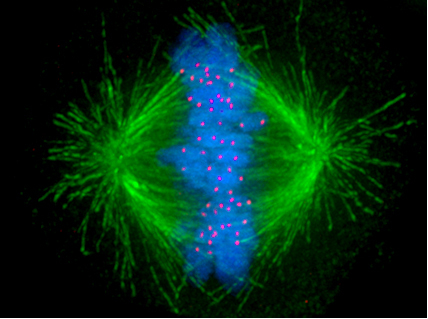 These motors are critical in forming the mitotic spindle in the dividing cells, where microtubules pull chromatin in various ways. These functions occur with motors and with many specific associated proteins. They help with the opposite orientation in the dendrite, by sliding out the ones with the wrong orientation. Other motors are involved in creating branching of the lattice. 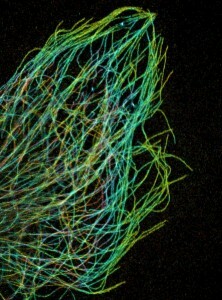 Most microtubules are in bundles, tied together by several molecules, most notably the well-known tau. 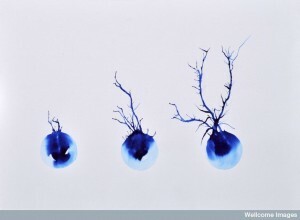 Tau is in both axons and dendrites, whereas others are specific to one. Tau is particularly dense in the longer portions of the axon. It is tau that makes organization of the bundles appropriate and stable. Microtubule bundles grow straight in the dendrite but then have to dramatically turn to create spines. Actin with its special proteins and motors links the microtubules together at this branch points. 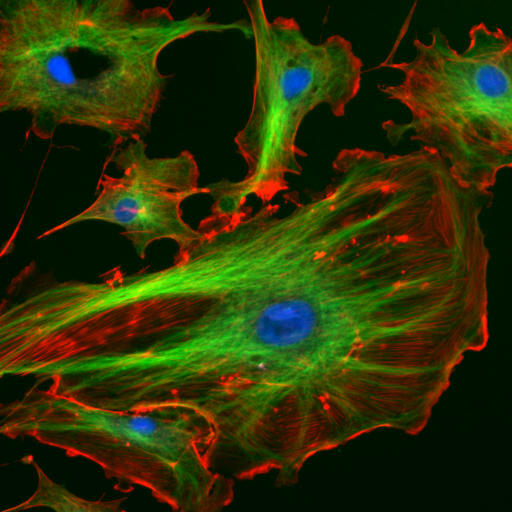 Other mechanisms involve calcium signaling promoting actin structures that promote microtubule structures. Are Microtubules the Brain of the Neuron? 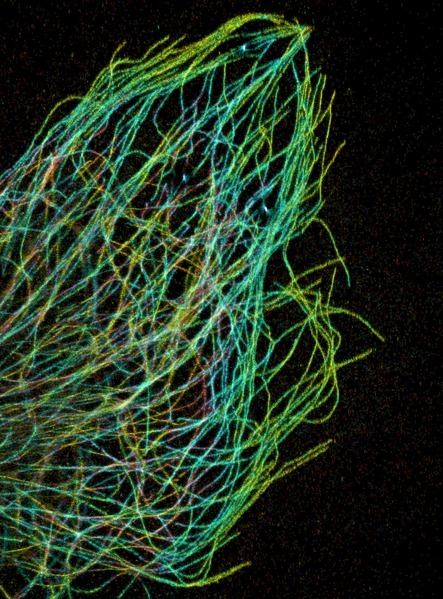 The actions of microtubules are fantastically complex. They respond instantly in a vast amount of different ways to mental events in thousands of places throughout the neuron at once. How is this directed? How can anyone think that this is a random process? How can anyone not see that mental events direct these fantastically complex processes? This entry was posted in Blog, Neuronal Plasticity, Cellular Intelligence, Human Brain and tagged Microtubules direct cell division, microtubules produce shapes of moving neurons, Microtubules are highways of transport, Microtubules are constantly being built and torn down, Microtubules respond instantly to mental events. Bookmark the permalink. It is clear that scientists currently have a whole world of complex machinery to uncover that is directing cellular activity. Systems that precisely detect events, the knowledge of which will allow us to clarify matters. There is as far as I can see no evidence at all the “intelligence” or the “soul” is hiding in microtubules. I think that is a ridiculous assumption given the utter lack of knowledge at this time. All of what we see within cells is hard engineering, and if the “control centre” was in the microtubules, operating at a “quantum-level”, then it again would be based on hard engineering techniques. Hard engineering requires intelligence, Rob. It isn’t hiding at all. Intelligence is not ONLY in microtubules, but throughout all living organisms. Nothing whatsoever in life could be accomplished without mental causes. What you are saying is incompatible with Darwinian evolution, the current approved theory, in which evolution is a process that started accidentally as chemicals fortuitously combined to form cells, and improved through a combination of random change and fit-for-purpose selection in such a manner capable of evolving highly complex hierarchical designs and body plans (hox genes) shared across all species. To say that “intelligence is throughout all living organisms” sounds very mystical, me for one, I’m more interested in the hard facts. Personally, my opinion is that we’re finding far too much advanced design techniques in life for this to have ever evolved through pure chance, however, mystical it is not. You seem to have effectively contradicted yourself where stochastically selected systems are involved. Advanced designed techniques, if not acquired by accident, would have to be a product of biologically evolved intelligence, no? I agree with the first sentence of your comment, but in the latter sentence, I’m not convinced a binary decision is correct. Given that some processes look random, it could be so due to the incomplete understanding we currently hold. I’m holding out for a third possible answer. I don’t see any third way where design would consistently arise without a purpose, or that its purpose could exist without intelligence. The problem is that many later genetic evolutions, such as in the case of our own retina being modified to work with color, only came about because of earlier and very precise genetic changes to the structure, that much later allowed a couple of very minor changes to activate color vision. This combined with massive gene edits often delivered through viral vector, which seems to be an external driving force for evolution, seems impossible to validate with the current theory of evolution. We are clearly missing a vast about of information. If intelligence is a trial and error process, and evolutionary changes consist of a series of small changes made within the organism for a purpose of intelligently adapting to what can be considered changes to its environment, and continuing to be made within the organism to better adapt competitively as well (since the environment also consists of evolving competitors), why should that intelligence be seen as an outside force that works without a known mechanism, rather than a force that has evolved to operate a myriad of mechanisms within the organism? So while adaptations may appear to be evolving purely mechanical systems within the organism, there are no mechanisms anywhere, within living forms or out, that anyone has discovered have not been made to work in an intelligent fashion. How the non-living, non choice making systems were made to work by what source of intelligent construction is not the question here (although it could be), but the living and choice making systems that have evolved in our world must rely on their own internal systems to evolve to both construct and reconstruct themselves as needed. And they do so in what to our rational human brains are amazingly complicated ways – since the intelligence that was needed for this resides in every cell in our bodies, including those of the various bacteria and other microbes and viruses that live within us as well; and we have no conscious way to communicate with these other systems well enough to know exactly what’s happening, nor do we need to know this to make the systems work. But we wouldn’t be here on the internet that had to have been intelligently contrived by humans so that we could better learn how all these worldly (if not other-worldly) systems work if our curiosity (also an intelligent function) didn’t feel the need to keep on knowing. “why should that intelligence be seen as an outside force”? Because what scientists are seeing is an extremely sophisticated level of coordination within and between cells, yet they cannot see the origin of that process. They know that if a microtubule is cut, a protein detects that cut, and rebuild both ends, but know one knows how it is detected, by what, and what it is that makes the repair proteins go to the right place. Its a really big mystery at the moment. Obviously the repair proteins are acting logically and following an intelligent process. But since we can’t actually “see” intelligence as a material entity, should we thus assume it’s outside of the organism, when it should seem obvious that the unseen force is operating right there on the inside? We can’t “see” the wave function of energy either, yet we accept that it is there activating its mass. Yes, but we can perceive intelligence in design, in the programing, in actions, the problem is scientists can ‘t find the control code in the genome (its in the junk DNA guys! :), the “CPU” of it all, hence the speculation that its hidden in the microtubules, below the quantum noise, where we can’t go. They know that motor proteins that carry those big bags of proteins up and down the microtubules, know what to collect because of “ZIP” codes marking transport, but the control of all this fervent activity is lost in the noise for now. All the control of all cellular activity would seem to need “intelligence”, it may be just a super complex self-regulating system… rather than intelligence. A super complex regulating system would not work without intelligence, nor work without having been intelligently constructed to begin with. Intelligence is defined as the ability to apply knowledge and skills, which is of course what any regulating system, or designing system, or constructing system would be required to do. Anything that uses energy for example is using an intelligently directed force. We can predict what energy will do if we know how to direct it to, but only because we’ve discovered that it responds to our intelligent direction. Can our energy work without intelligent direction? If it could, we wouldn’t be able to count on it at all, and certainly not in any way productively. Does intelligently directed energy make mistakes? Yes. But the mistakes are made intelligently.. Otherwise we would not have had the ability to use our own energy by “trial and error” to evolve our systems. And why do these communicative cells need their own intelligences to energetically force their agreed upon changes? Because they are using that individually evolved intelligence to properly direct their own energetic forces, not letting some outside system of intelligence blindly decide to do it, Or worse, as Darwin seems to have had it, and now Dawkins, to do it accidentally. – intelligence is a DERIVED PROPERTY. i.e. like temperature . Temperature is not a fundamental force/property – like gravity for example . How many “intelligilitres” does your brain posses ? I presume you will concede that intelligence exists in humans. It’s the ability to operate strategically, and as a matter of fact, if represents the various uses that energy makes of particles – human or non-human. It’s not derived from other properties; if anything, it’s the driver. Temperature is a measurement, by the way, intelligently derived to measure the overheated. OK, so intelligence barely exists in some humans. Do you have a logical point to make? I have a problem with what you seem to think is logical. Not rhetorical. I take umbrage at your position. And by the way, temperature is a measure of how hot or cold we find energy. And if intelligence is not an evolved property but an emergent property, please tell us what it emerged from and how, and especially why. What you’re saying doesn’t work when the earliest and most primitive cells had super complex ribosomes and much other advanced molecular machinery that worked with mathematical precision and error correction. Would that have been accidental precision and accidental correction? I agree with Roy Niles. There is no third option between intentional and unintentional. It is either “fortuitous” accident or it is by intelligent will, and all evidence indicates the latter. Even if there turns out to be trillions of chemical reasons why complex function keeps arising, it would still need to be extreme luck for any of it to be an accident. Trillions of organisms make trillions of movements a day and they are nearly all functional. There has to be a reason for this, other than luck. Yes, we have to keep our minds open. Following Darwinism, we are an evolved biological intelligence. But we are forever trapped in the chicken and egg scenario, where cells that require great intelligence in their function cannot exist without firstly that intelligence existing. If it exists in the mystical “sub-quanta zone”, then there is a whole new world waiting to be discovered. This parallels the ribosome conundrum, in that a cell cannot be built without this and other advanced micro machines. A criterion for the existence of a ” hidden supreme prescient designing hand ” would be lack of glitches and “blue screens of death ” in the operating systems of terrestrial life . This is patently untrue .. e.g. :Inherent propensity for cancer and malformations ; imperfect vision ‘ blind spots ‘ ;propensity for illusion -optical and intellectual ; bad design of human spine and teeth ; designed senescence – suffering of old age . Feel free to add to the list – I have missed out more obvious ones . Darwinism is not at all currently approved. No serious Biologist still considers mutations to be random in the slightest. In somatic cells, we get some 10 quadrillion cell divisions rife with trillions upon trillions of mutations within our lives. If mutations were random, the human race could not possibly survive for even a few days. As to your feelings that intelligence is “mystical”, I don’t see how your personal beliefs have any relevance to science. If I consider relativity to be mystical, do I refute Einstein? How much weight should science give your personal objections? Its just garden variety intelligence, the most certain fact in all science. Conscious intelligence is the ultimate axiom. To me, intelligence is the only thing that is NOT mystical. It is pretty straightforward and directly experienced by each of us. I can see no reason to object to intelligence, let alone any reason to overturn overwhelming evidence based on personal feelings. Firstly I did not say that intelligence is mystical, rather that people were talking in a mystical manner, which I reject, about a “mystical intelligence” hiding in microtubules. Mutations are random when driven by DNA damage or other mechanistic failure within cells. Whether there is useful order following the chaos of random change is another matter. I basically consider, given the information I have seen, that evolution driven by viral vectors seems very far from random. Do you mean transposons? As the tools of Evolution . If I understand Rob’s use of the term “hard engineering” as he intends it, then the rules of chemistry are what primarily drives the apparent engine behind cellular activity. However, there is a weakness in ascribing a mental cause, in that to “mentate” is to introduce a slight delay in a needed response. A lever, pressed down on one end, does not have to ponder raising up on the other end. Neither does “intelligence” require mental activity. I personally object to “chemical activity” as being the prime reason behind my mental ability to think. At some point between inorganic molecules and higher mental states, an organism (or its constituents) becomes self-aware and self-directing. I don’t think we have enough data to yet determine where that tipping point lies. However, if I were to make a WAG* (wild-assed guess) on where to look, I would think it lies somewhere down the complication path where proteins begin to fold in certain ways. I don’t think anyone knows how EVolution works precisely ! … Darwin did not know about DNA .! As a ‘scientist ‘ myself by dint of training ,I would say that : thesis’ in order to be discussed , need to use precise terminology ..: I have a problem with the use of the multifaceted term ” intelligence ” … We can’t scrutinise things if we don’t agree on the same meaning . According to Ox.En.Di. ” intelligent is an adverb of five different meanings . I don’t see a ” prescient hand ” in life’s design … Too many faults and bloat . RC , As a design Engineer .. Would you care to put some light on the question and the possible answers ? Any views on the Goldilocks Enigma ? Intelligent capacities evolve intelligently. The chicken uses its evolved intelligence to construct the egg. Starting with a shell that has no capacity for intelligent activity – no intentions and no purposes of its own. That shell is there to serve the chicken’s purpose, and contains the living, yet brainless, material placed there by the chicken that has nevertheless been intelligently instructed not only to grow itself but how to do it, and unless some other living thing has found another use for it (like eating it), the chicken’s heretofore brainless set of material purposefully self-constructs a brainy baby chicken. The egg has thus served the chicken’s purpose and not its own. The brainy baby chicken purposefully moves on to attempt to serve whatever purposes it was meant to by the chicken, plus those it has managed to intelligently acquire. Or to serve those other purposes (such as ours to eat it) that are intelligently required. intelligent beings in outer space. An intelligent terminal can edit input before transmission to a host computer. Archaic. having understanding or knowledge (usually followed by of). Intelligence is a noun. Intelligent is an adjective. Either way, you haven’t shown that intelligence cannot at the same time be intelligent, or that ‘intelligently’ as I used it will only be useful here as a metaphor. But to ease what seems to trouble you, I’ll rephrase the comment. The intelligence that life uses to evolve is essentially the same as that which the universe has and must have always had to use to intelligently evolve itself. ‘–: “How can anyone not say [x y z] is extremely intelligent [xyz ]? The only meaning of INTELLIGENT **is that one I listed above as No.4 ** meaning smart data handling – equipped with sensors to detect and to handle data . I am not lecturing anyone on my views (as some others would ).. just pointing out our lack of understanding . Mental events control other mental events. Control is never absolute as the events being controlled can also be reacting unpredictably to the controlling efforts. But physical efforts are always mentally directed, even though you may feel that microtubules are no substitute for actual brains. But cells communicate cooperatively with other cells, right? Which would need to be for intelligent purposes, right? Which would need intelligent “mentalities” acting to control the mental processes of each other cooperatively. My question would be, what happens when they disagree? Do they compromise, or is there a pecking order involved, etc. “Too many faults and bloat” to have intelligent design, you mean just like Microsoft Windows? hahaha, if there is an intelligence as a driving force, and I say if, then it might tinker and tamper as it likes, might copy modify and paste, might experiment, and very probably would.